In the wild walruses can live for 40 years. 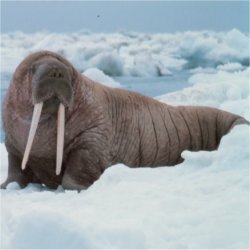 Sharks, whales and polar bears are among the few animals that will hunt and eat walruses, although even they tend to avoid fully grown healthy adults. They prefer to attack, young or sick walruses. If you want to know how old a walrus is, you can count the number of rings on its teeth in much the same way you count the rings of a tree. A walrus has two tusks which are made of ivory. Tusks have been known to grow as long as three and a half feet. Walrus tusks have been carved for centuries. Tusks can weigh over 1.5 kg (about 3 lbs). The Latin name of the Walrus is Odobenus rosmarus, which translates to mean ‘tooth walking sea-horse‘. The walrus has two sub species, the Pacific Walrus and the Atlantic Walrus. Walruses face the most danger from man. Past hunting of this animal led it to near extinction. The walrus populations are now carefully monitored. Certain aboriginal cultures are still permitted to hunt the animals, as they are still a large part of their survival and culture. The sale of walrus ivory is carefully watched world wide. Walruses spend most of their life on land. An adult walrus can dive up to 80 m and stay underwater for up to half an hour. A walruses tusks never stop growing. They use their tusks to help make breathing holes in the ice. Walruses use them to pull their enormous bodies out of the water and onto the ice floes. The tusks also are used for fighting and as a sign of stature within the herd. The longer the tusks, the more important the animal. Unlike their close relatives the seal, walruses have four flippers. When they walk on land they rise up on all four limbs, they do not have to drag their huge bodies across the ice. This entry was posted in Animal Trivia and tagged Walrus, Walrus facts, walrus herd, walrus herd trivia, walrus herds, walrus information, Walrus trivia, Walrus trivia facts by Jane. Bookmark the permalink.